A couple of years ago, my son had cancer. During his treatment and recuperation, he developed an interest in Youtube cooking videos. As he got better, I wondered if that could lead to an interest in real-life cooking. We enrolled in the Saturday Cooking Club at the Rehabilitation Centre for Children. Each session focuses on one open-ended recipe. 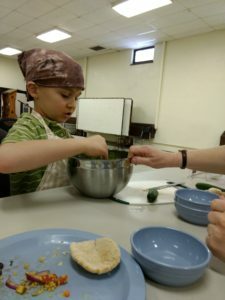 To start, each child and parent is given a plate of possible add-on ingredients, and an opportunity to touch, smell and taste. 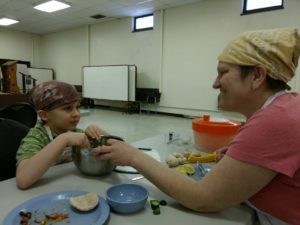 Then parent and child get to put the recipe together, adding the extra tastes that appeal to them (chocolate chip perogies, anyone?) The pace is slow and relaxed, the focus on social interaction. Because he has autism, working together at home can also be a challenge. But we found some benefits in visiting the club each Saturday. Preparing food together is a great way to learn by modeling, turn-taking (“can you stir this for me?”) collaboration (“hold this while I pour”) and problem solving (“Uh oh, our bowl is too small!). Through the session, the facilitators model and invite participation between parent and child. Being away from home meant there were fewer distractions and we had some of the prep done for us. 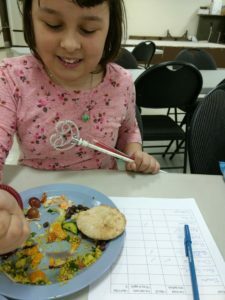 It’s the perfect setting for communication while doing something, and the results are also very social – we could enjoy eating together, and also meet other parents and children. The pace is gentle; there is no pressure. Kids can sit back and watch if that’s what they need to do. In the second session we attended, our daughter decided to come too, so then the four of us came together. I was amazed at how many things my children were willing to do and taste in this setting. Salad day, in particular, was spectacular! Almost every vegetable was tasted. After awhile, it occurred to me that we could use this activity to connect with friends in our own social network. 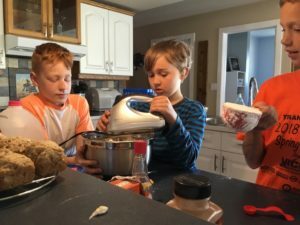 So a couple of my friends and I decided to do some baking with our kids, that we could enjoy together and also share with people in our church. 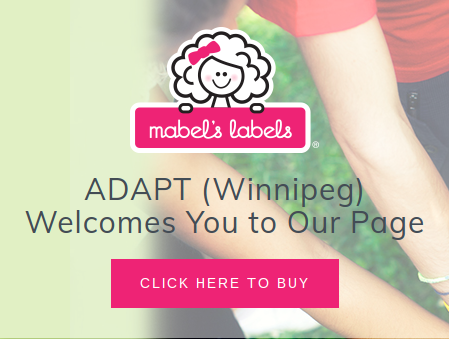 We found everyone enjoyed it, and it was a great way for people to see my children in a new light – capable and fun to do things with! Cooking Club became a springboard for us – an opportunity to learn some new skills that could then be used in an inclusive, community setting. It’s a great example of the idea that if we help our kids follow their interests (or explore new ones), they naturally develop abilities and find ways to connect with others who also enjoy the same things. The fall session of Saturday Cooking Club at RCC runs from October 13th to November 24th (no class 17th). Download the registration form here. To see the poster for more details, download it here. Maybe cooking isn’t your child’s thing. Fall music therapy and yoga programs at RCC are running from October 13th to December 8th (no class on November 10th). Please note that registration for these programs is on a rotating basis; you’ll indicate your interest for the entire school year when you fill out the form, and they do their best to make sure that everyone gets to attend at least one session. If you have any questions, please feel free to get in touch at lifeprogram@rccinc.ca or 204-258-6500.